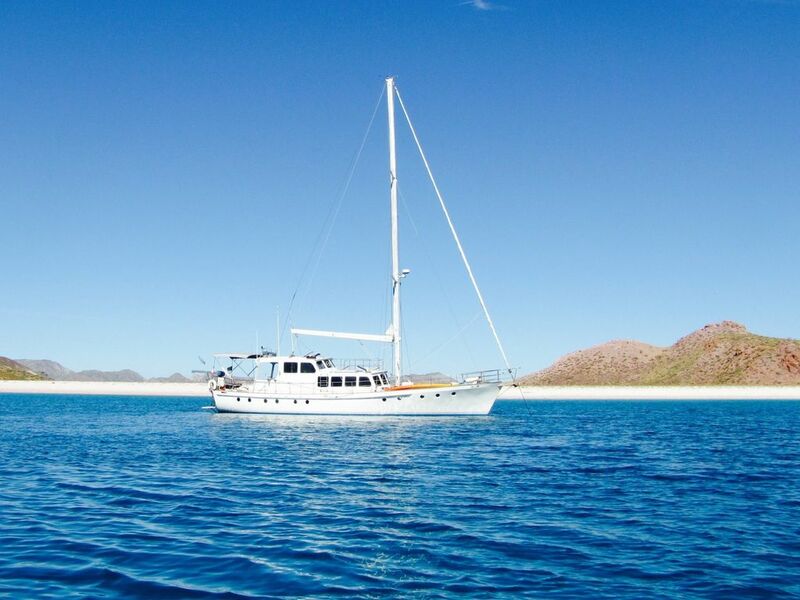 Our Beautiful custom 70’ motorsailer is the perfect place to stay in the bay of La Paz "The Peace" Baja's beautiful seaside capital city. We are located near the malecon along the beach where you can enjoy many things to do. Watch for dolphins pass by while aboard, BBQ, breath in panoramic sunsets and stargaze from our large deck. Boat and breakfast: Stay aboard in the Bay of La Paz, BCS $60USD per person min 2 people min 2 nights. Ocean Villa offers plenty of space for your comfort with a solid steel hull for stability. We are anchored in the bay and yet we are always in site of land. Choose a crewed excursion and adventure tour of the bay or an overnight* charter to the exquisite marine protected bays and islands of Espiritu Santo & beyond. Snorkel, kayak, hike and walk the secluded sandy beaches and swim in gorgeous crystal clear aquamarine waters. Lounge and BBQ on our spacious deck or enjoy our comfortable lounge with large wrap around windows. Try your hand at sailing or sit back and enjoy the cruise. 2 to 5 day charters to Isla Espiritu Santo and Isla San Francisco Islands near La Paz to 7-10 days to Agua Verde & Loretto. Visit the incredible bays and islands along route. Experience an adventure trip of a lifetime! Charter prices include cruise/sail to bays or islands, meals, non alcohol beverages, snorkel gear, kayaks, swimming, trips to shore to hike to amazing view points and to walk along the pristine beaches. While you are in La Paz you can swim with the whale sharks, snorkel with the sea lions and take advantage of exploring one of the most spectacular seas in the world by taking a trip to Espiritu Santo Island and beyond. The islands are UNESCO world heritage protected, they are uninhabited, the water is so clear you can see to the bottom and the beaches are pristine. The hiking offers great views and the rock formations are mind boggling so interesting and make great photo opportunities. Stay aboard and enjoy being on ship and exploring La Paz and if you choose, join us for an island adventure of a lifetime. We left our careers in Vancouver, BC Canada to live the dream life on the sea. We purchased a big ship so we could share this dream with guests. It’s all about having fun and experiencing life aboard our beautiful boat. We encourage our guests to participate in thier vacation to make it your own incredible experience! We are an original, a large custom three story boat. We are a motorsailer which offers a lot of stability. In a favorable wind she sails, with no wind she motors, so we always get to our destination reliably. We offer both cruising and sailing depending on what our guests prefer to take a hand at the helm or grab a line or sit back & enjoy the cruise. Guests have commented about the feeling of space as well as little to no motion sickness which is a huge benefit particularly for those unaccustomed to being aboard a boat. We are custom built in New Zealand there’s no other boat like this one. Guest cabins have a full private head. There is a guest 1/2 head off the galley. There is an additional head in the captains cabin for use if needed. Minutes from the malecon, Centro and historic town. La Paz is a beautiful seaside town to explore. It’s not a resort town filled with tourist traps. We are available for charters to exquisite marine protected islands & bays of Espiritu Santo no houses, no bars, no wifi, just pure natural beauty! Panoramic views aboard the boat. We are close to the beach at the malecon. We are a short dinghy ride to the El Mogote golf course or you can take a water taxi from town. You can see the cathedrals, the old lighthouse and more. Panoramic / we are in the sea! Dolphins pass by daily. We are on the sea! No access aboard boat. Available at marina unlimited for $200 pesos or at most cafes nearby in town free. Large salon area with plush benches and big wrap around windows very bright & spacious. Guests have your own personal fridge. We have a large table with wrap around bench in the galley for dining. Guests often choose to eat on deck where we have bench seating for up to 10. We have a smart TV to view photos & videos on a USB stick or external drive. We have plenty of movies to choose from. There is no TV service aboard. Plenty of movies to choose from. Not that you’ll need them you’ll be having too much of a fun adventure! Large aft teak deck with sunshade, forward deck and a topside deck for 2. Snorkel masks & fins, 2 ocean kayaks free to use, a Brownie Dive Hookah for 3 @ $25/hr Wet suit and Paddle Board rentals available in town. Island charter excursions available. Please inquire. We have been able to accommodate seniors and people with limited mobility, However, this is a boat, there is a ladder to board ship and steps inside. Not suitable for young children. Families welcome with children ages 12 and up. Located a short walk to the malecon by the sea and beach, a great social scene or enjoy an ice cream in the beach under a palapa. The malecon is lined with cafes, restaurants, art, museums, open air market, music events, volleyball tournaments, carnival and more. We are available to take you on aday sail or cruise of the bay and snorkel with the sea lions, or on an overnight excursion to Isla Espiritu Santo to exquisite bays & beaches to snorkel, kayak, hike, watch for magnificent marine life. Day tours $125 pp (min 4 people),includes lunch & snorkel gear. Dive extra. Includes captain & cook, snorkel masks & fins, 2 ocean kayaks, trips to secluded beaches and bays to hike & explore. Reserve your nights on Homeaway and pay the difference through us. We are the best value in the sea and you’ll have a truly amazing time!